You can receive xMatters alerts as text messages on text phones and pagers, and respond to the alerts if your device is capable. If you have been notified via a one-way pager, you must call into xMatters to respond. For more information, see Call into xMatters to retrieve alerts. 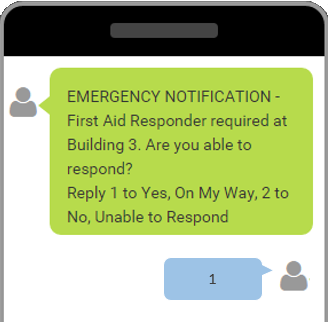 If you are notified via a text-enabled (SMS) phone or two-way pager, the instructions and response options will be listed within the message itself. Most SMS responses do not include support for additional annotations or notes. Keep your responses short, and limited to the options described in the notification. Undelivered SMS alerts stay active for two hours, after which they're marked as expired and discarded. This is to address inherent issues with the technology, such as the inability to see when a message was actually sent. This way you don't receive notifications that are outdated and no longer need your attention (for example, when reconnecting after a long flight or after a provider outage). We recommend adding a backup device such as email, phone, or the xMatters mobile app to cover these gaps with SMS. The maximum length of a text message is 160 characters. SMS messages longer than this are split into multiple texts, which may break embedded links or URLs that are included in the message. To receive long texts as a single message, you can enable multimedia messages (MMS) on your device. Confirm with your provider that they support MMS, and then check that it's enabled in your device settings. Alerts may appear differently on your device, and the message for your alert may have been formatted by your xMatters Administrator to include different options and display features. When you receive an xMatters notification on your SMS device, each response option will be associated with a number (e.g., 1 - Accept, 2 - Reject, etc.). To reply to the message, enter the number for your response choice. When you press Send, your device communicates your response choice back to xMatters, where it will be associated with the event that prompted the alert. If you are using a two-way pager or your deployment does not have simple SMS replies enabled, you will have to type in your response. Follow the instructions included in the notification. 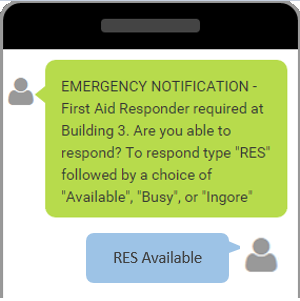 In this example, to reply to the alert you would type "RES" followed by your response choice.